Another fabulous mountain day. We awoke to blue skies once again, and they stayed that way all day. The plan for a relatively easy day offered a good excuse for a lie in. So it was 9.30 by the time we set off from the apartment, heading for the main street and a footpath leading up the Trift Gorge. After yesterday's exertions, and with our first destination hovering seemingly directly above us, a very leisurely pace was in order, with frequent pauses to read interesting information boards. Did you know that Bearded Bellflowers (the hairy ones) are warmer inside the bells and provide a warm home for overnighting insects? 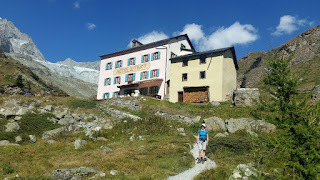 After a while we had somehow gained the 350 metres necessary to reach the Edelweiss Tea House. Coffee and cake went down well, and some Project 1949 photos were taken. 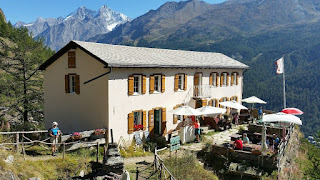 The Tea House (aka Edelweiss Alterhaupt) has been there since 1898. The route ahead was debated and after a long break we headed on directly to Hotel du Trift, a further 400 metres above us at the head of the gorge. More drinks, but as we were carrying our lunches the owner was foiled in his bid to sell us any food. He did show us some nice pictures from 1909 though. There were some mountain bikers here, and a Swiss chap from Thun who had bivouaced overnight somewhere high up between here and the Matterhorn. Bravo! A plan to return the way we had come was foiled by the brilliant weather. 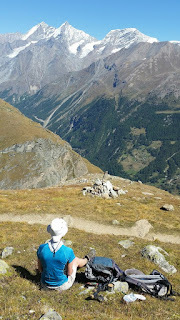 We decided to continue by way of the well graded path up to Höhbalmen, some 300 metres higher at around 2700 metres. We reached a high corner at around 1.30 and stopped for lunch. The mountain vista was virtually matchless, a wide horizon of snowy peaks under a deep blue cloudless sky. 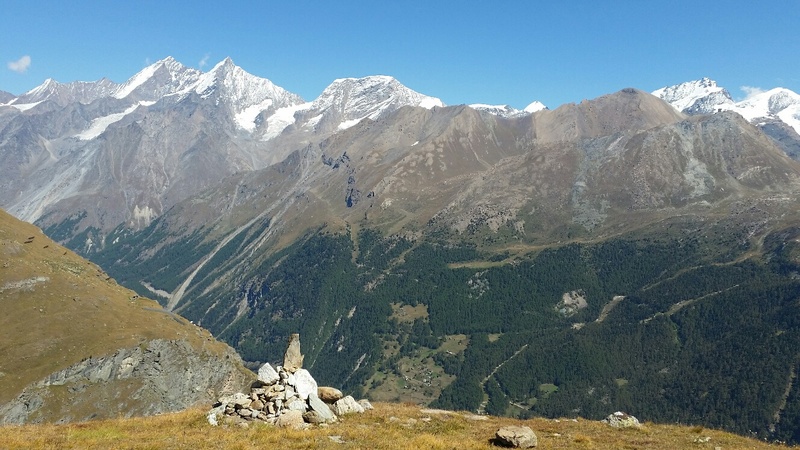 From Dom, right across the horizon to Kleine Matterhorn, we could feast our eyes on at least eleven 4000 metre summits. 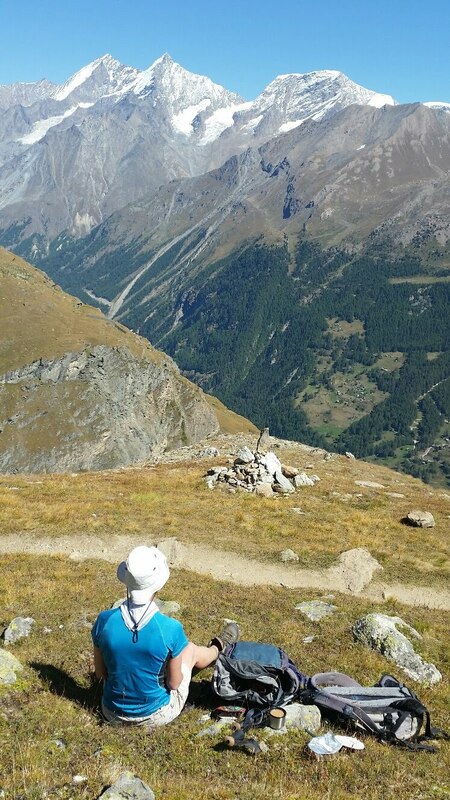 Our entire visit was put into perspective as we could see virtually all of the routes we had walked. Only the Matterhorn was hidden from view, and that revealed itself (as if we haven't seen enough of it) immediately after we started walking again. 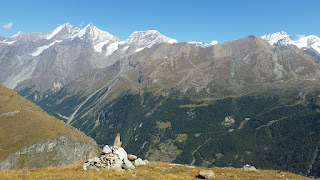 In the distance we could see people on some of the peaks, and also descending the glacier from Monte Rosa. 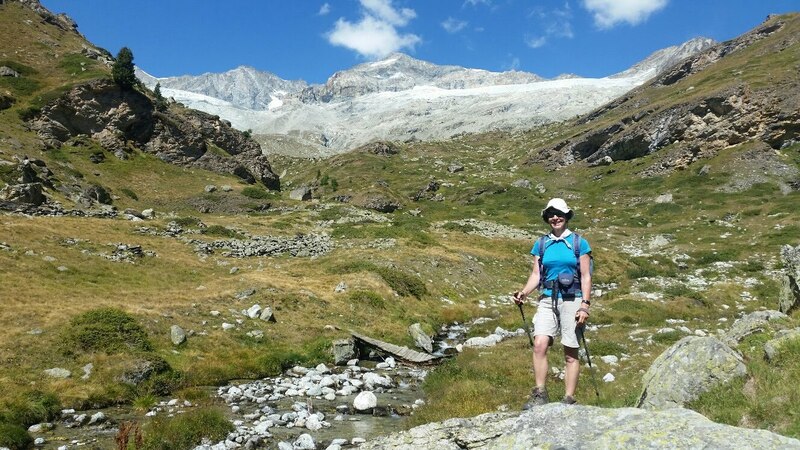 After almost an hour we dragged ourselves away and continued to Höhbalmen, passing the time with a lady who was the only person we saw on this path. The air was crystal clear. What a contrast to our visit last year to the Rockies, with their crowded paths, smoky air, and long drives to some of the walks. And Zermatt is one of the busiest resorts in the Alps. The well graded path got us quite quickly back to the Edelweiss Tea House, from where we returned to the admittedly busy high street. We then diverted up towards Zum See to secure the last of our 'Project 1949' photos of the trip. It has been a fun project, the success of which will be judged later. We failed to reach quite a number of the viewpoints so may well return. We would certainly use this Dolomit apartment again. It lacks a view of the Matterhorn, but it's very comfortable and everything works. But we will bring a chopping board next time! We took some time to find the view to 'Old Zermatt' pictured in the 1949 album. It has changed, but we think our last image was taken in roughly the same place. We were back at base soon after 5 pm, and soon after that we were enjoying a sumptuous feast in a bid to lighten the load that we take back to Täsch. 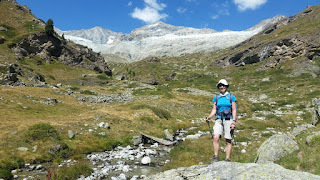 We walked about 15 km, with 1100 metres of ascent and descent.